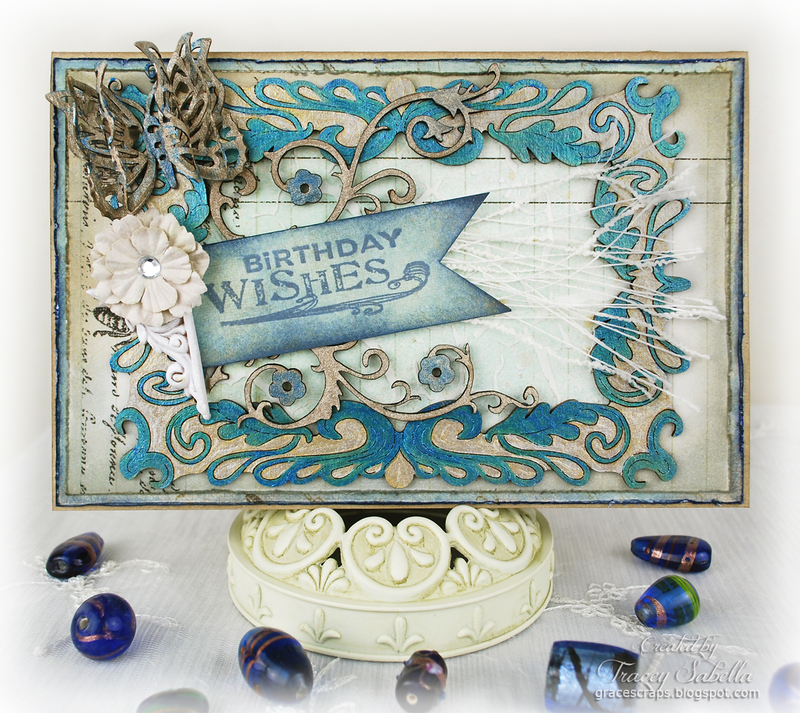 Hi, it's Tracey, back to share a card I've created featuring gorgeous Leaky Shed Studio chipboard. 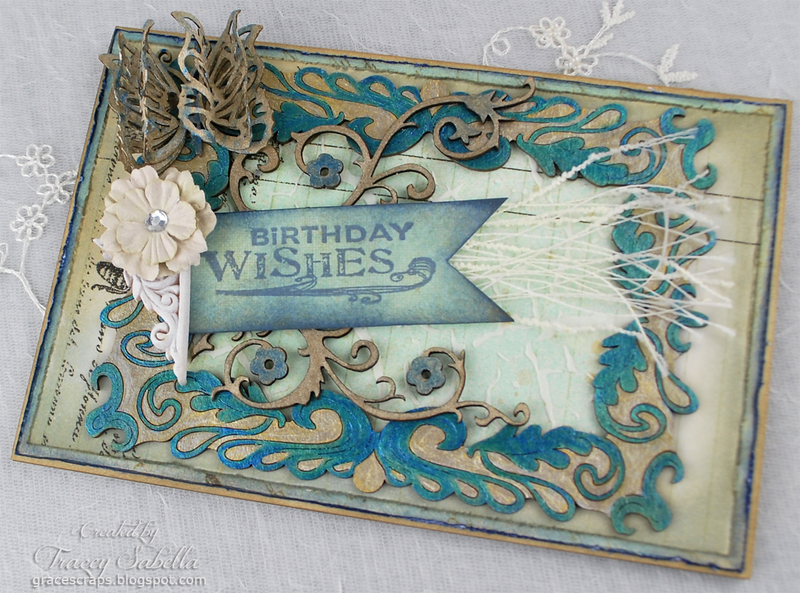 Birthdays are special days to celebrate, and I enjoy creating handcrafted cards for my family for their special days. I took the one of the small butterflies and soaked it in warm water until it was soft and wet through. Then I pulled each of the wings apart into three layers, leaving the body and antennae intact. I curled up and shaped the layers with my fingers and heat set. 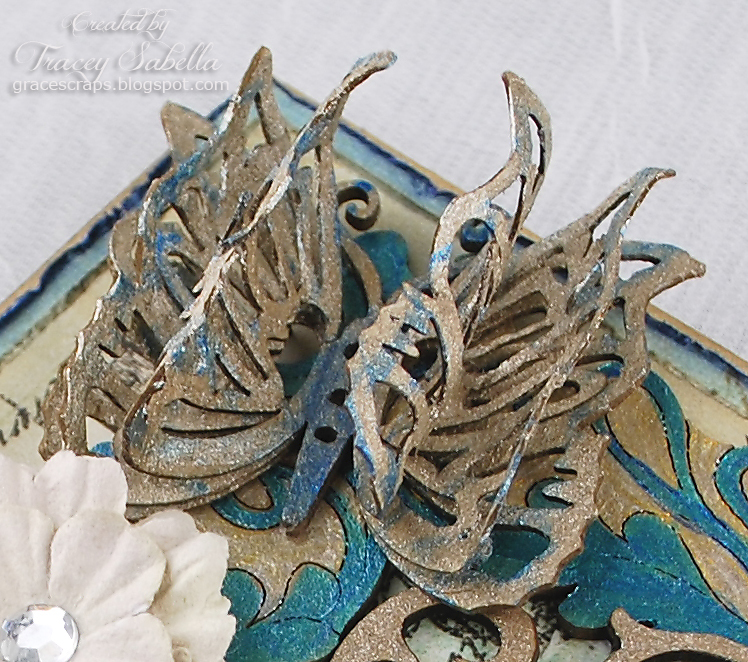 I painted with gold metallic paint, then dry brushed with metallic blue paint. The Blowing Leaves Frame was painted using a fine tip paintbrush. One of the things I like to do is to swirl two or three similar colors of paint together, but not mix thoroughly. Then, when I paint, I get variations in the colors. Here's another angle of the butterfly corner. I stamped the sentiment onto a flag shape I had cut and inked, then added a resin piece and flower to the base. I cut a Flower Corner into two pieces to layer under the sentiment. I treated it with a quick coat of metallic paint. 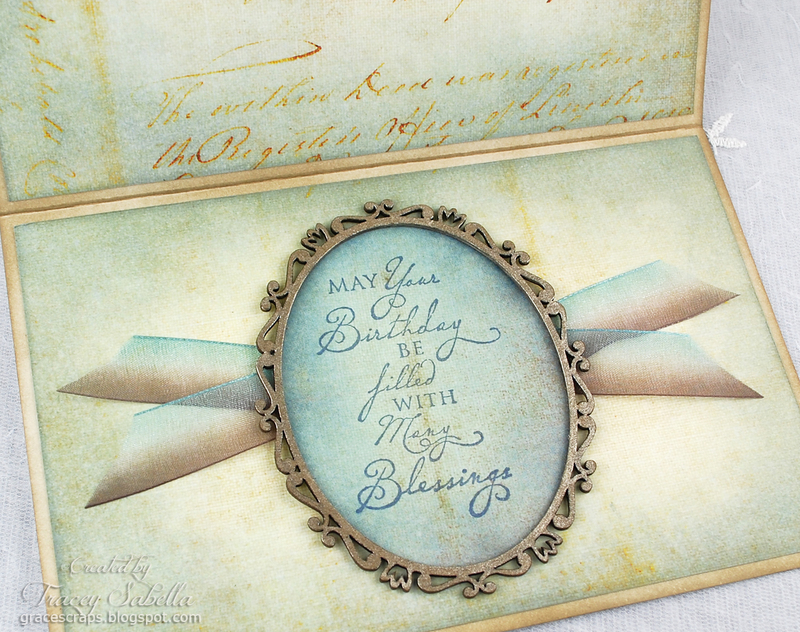 I've used another chipboard piece to frame my sentiment inside the card, the medium Victorian Oval Frame. I folded and tucked a piece of ombre organza ribbon on each side. I've painted this frame with more of the gold metallic paint. on my blog, Garden of Grace, on Saturday. I hope you've been inspired to grab some Leaky Shed chipboard and created a card for a special person in your life! This is gorgeous! LOVING that butterfly!!! 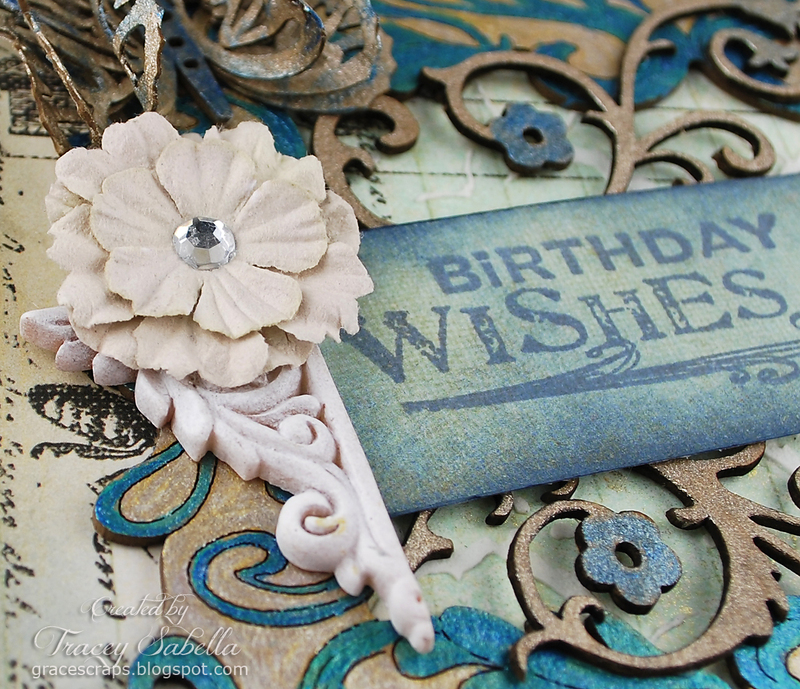 Your card is so gorgeous Tracey! Love what you did with the butterfly! Just gorgeous Tracey! Love that butterfly!!! 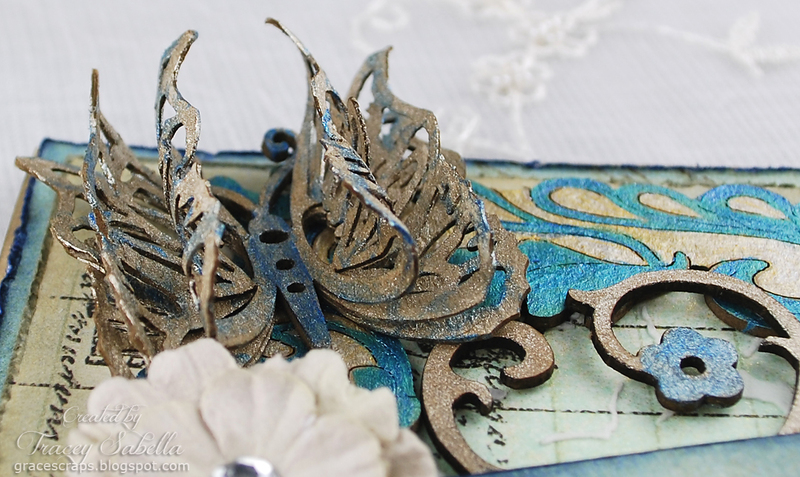 Thisis so pretty Tracey love all the chipboard.